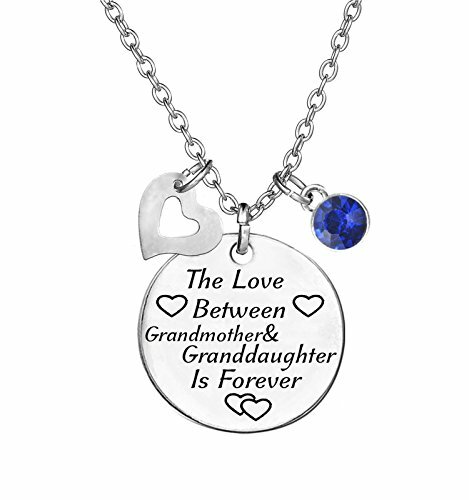 The Love between Grandmother and Granddaughter is Forever,The charm of the crystals, because of cutting and angle reasons, in different light and environment (different colors of light, angle), easy to produce false recognition in the visual. Please identify in the sun. The picture shows the natural sunlight. Please check under natural light. May corresponds to emeralds and is easily mistaken for black. Material: Stainless steel,Shiny crystal.Chain length:about 20 inch,Pendant Size:About 1" stainless steel disc ,heart Charm:about 0.6"
If you have any problems with our items or services, please feel free to contact us first. TISDA will try her best to make you have a nice shopping experience. If you have any questions about this product by TISDA, contact us by completing and submitting the form below. If you are looking for a specif part number, please include it with your message.